The last couple of days haven't been the best with work. Little silly mistakes like a misspelling (that is very easy to fix) but becomes a much larger mistakes when the quality control people don't actually look at the edit before handing it off to a client, and then I look like the dummy for some reason. And it's not like I am just willy nilly misspelling everything, but it happens sometimes and you just don't catch it because you've watched the edit about 1000 times already that day. What I think makes it worse is that instead of just brushing it off, I get what I call the stress tummy. Where my stomach gets all tied into knots and I just feel all gross, and it takes me forever to stop feeling that way. The sad thing is even if I did nothing that would justify feeling this way I still get the stress tummy. I have been trying my best not to let things drive me to the stress stomach and I think I am getting slightly better at it, but it still lasts at least for a couple of hours. But my day did a total 180 when I got an unexpected gift in the mail from my wonderful friend Lex! 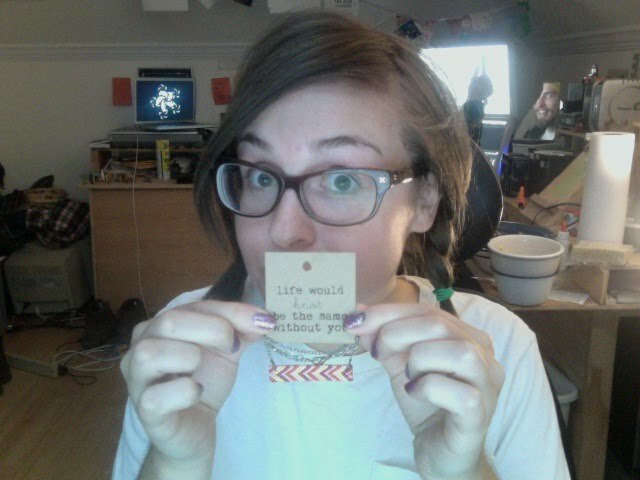 She sent me this absolutely adorable friendship necklace from this wonderfully cute shop, Leftover Charm. She told me that she got one for herself so we could be twinzies, we've actually been mistaken for twins quite a few times, so it was pretty fitting, hehe! But this surprise little gift absolutely made my day so much brighter. Unexpected snail mail is one of my favorite things in the world. PS Did you notice Will giving the thumbs up in the background, I actually didn't notice until after I emailed this picture to Lex thanking her, and it made me laugh so hard! Hahaha I love Will's photo bomb, hilarious! And what a lovely gift! Will always does do the best photo bombs, that's for sure!